Dr Molly Black :: New wig by Lana now mine! Title: New wig by Lana now mine! New wig by Lana now mine!, originally uploaded by mollyblack. I'm exhausted and can't sleep. Shawn is trying to take care of me even though he has to work current crunch time remotely which makes it more difficult. And the pain has been horrible on-and-off for the past 12 hours. Anyway, the wig is one I purchased from Lana (as almost all my wigs that are awesome like this come from her) arrived just now so I took 10 minutes to fight the pain put the wig on as much hair as I could cover without a cap. I wish batty would want to have me wear one of Lana's wigs when we do the runway. I wonder if there is any wig I have of hers that would appeal to the designer of the Sleepy Hollow dress (for instance). 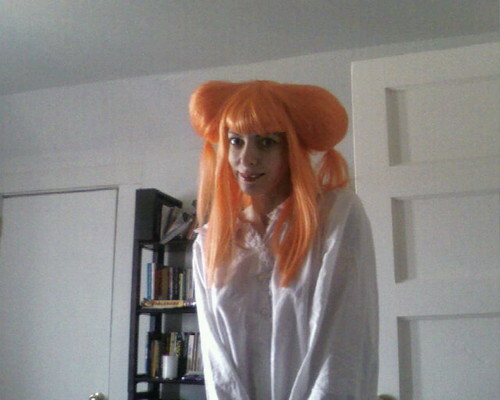 I have the purple dread wig, the brown glitter wig, the red bouffant 50s style, and now this orange anime wig. I don't think I have any others of hers ... at least not unpacked yet. I have the Cher style long black with pink chunk strips and the totally insane red one that is braids and back-combed to freaking an inch of every bit of it from San Diego. Plus I have about six cheap costume style wigs and three good ones that look really close to real on me. I am very devoted as a customer to my friends. Almost all Shawn's ties are made by Bethany's Cyberoptix tie lines, my really nice crazy wigs are made by Lana, and now all of my corseted gowns and half my corsets are by Tracy's AzAc Designs. I love supporting my friends AND getting the most awesome stylish things to wear on days when I feel good and can model or go out to an event and show them off. I'm proud of the success of my friends. They're talented in their respective creative outlets in ways that just make me feel so blessed they consider me worth designing for. Plus Rich is a great designer, John is a great programmer, Hideki is a great musician and DJ, all my friends who teach achieve good careers that they want, my successful modeling and photographer friends don't have much envy - they have more of my admiration and respect. And then of course there is Shawn who is the most beautiful, brilliant, talented, and amazing man I ever met wrapped in one package. I'm so lucky. Just thought that I might share it.